Samsung installs world's first Cinema LED display for movie theatres | What Hi-Fi? Could the 34ft LED screen signal the beginning of the end for the traditional projector? Samsung has installed its first commercial Cinema LED display at the Lotte Cinema World Tower in Seoul, South Korea. Samsung claims the screen's peak brightness levels are nearly ten times greater than that offered by standard projectors. The company also claims its ultra-contrast and low-tone grayscale settings help deliver "the brightest colours, deepest blacks and most pristine whites at a nearly infinite contrast ratio". The screen works with a state-of-the-art surround system from JBL, which includes speakers bordering the screen and proprietary audio processing technology. JBL's parent group, Harman International, was bought by Samsung in 2016 in a deal believed to be worth around $8bn. The screen is fully compliant with the Digital Cinema Initiative's (DCI's) theatre technology standards, so it can match the complete colour spectrum set by the industry. 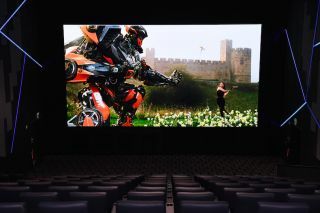 "Through sharper and more realistic colours, complementary audio and an elevated presentation, our Cinema LED Screen makes viewers feel as if they are part of the picture," said HS Kim, President of Visual Display Business at Samsung Electronics.